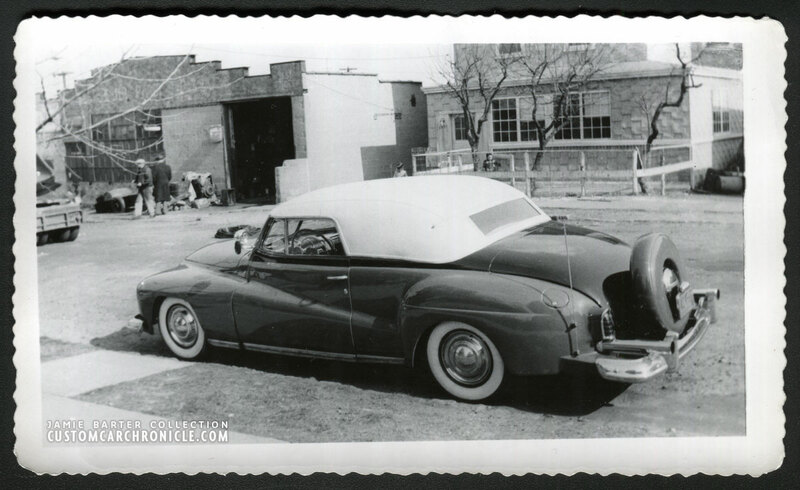 From the Jamie Barter Photo Collection comes this series of slightly oddly restyled 1941 Ford Convertible photos. 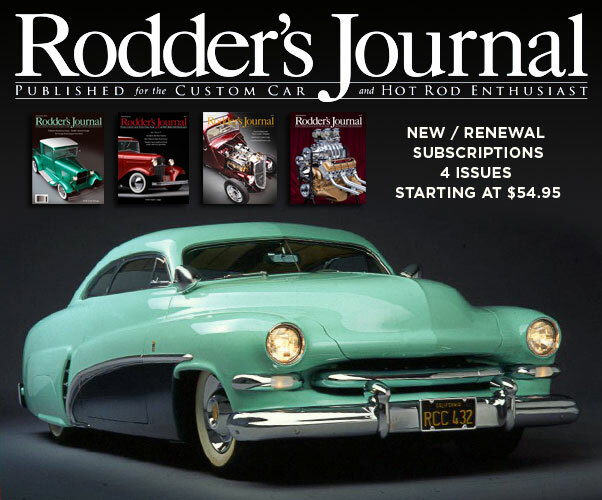 The car was created by Joe Gertler at the Raceway Garage in the Bronx around 1950. The cars created at the Raceway Garage are an odd mix of Sports Custom, Coachbuild, and Custom Restyled Cars all blended together. 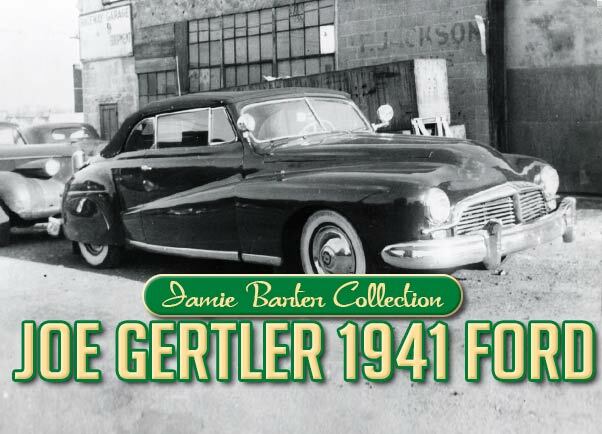 Joe Gertler was a pioneer Car builder on the East Coast of the USA who won many trophies with his uniquely restyled car. He was well known for building competitive Midgets and Sprint Cars, as well as Le Mans winning cars and Cars for well known people around New York City. Some had Custom body work, others received complete hand made bodies. The Raceway Garage was able to handle it all. More information about Joe Gertler and the Raceway Garage can be found on the Memaerobilia website. Most of the cars created at the Raceway Garage shop are not really suited for the Custom Car Chronicle. 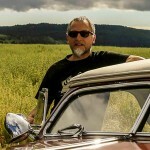 But the car in the series of photos from the Jamie Barter Collection shows a very interesting mix of Custom Restyling inspired from sampled from the West Coast, as well as European Coachbuild influences. The photos show two versions of the same car. The first most likely photographed in the later part of the 1940’s the second most likely around 1950-51. 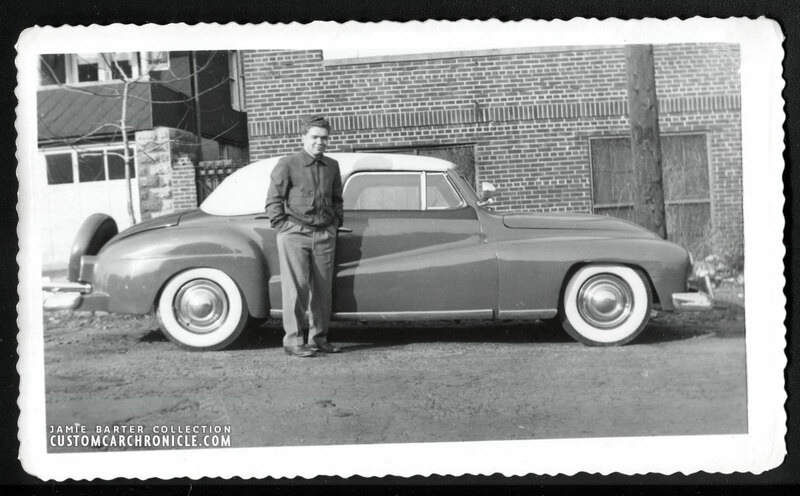 The photos in Jimmie’s Collection came with no additional information, other that the car was based on 1941 Ford convertible and created by the Raceway Garage in New York. From what we can see in the photos it looks like the car was channeled over the frame, the fenders front and rear where raised to meet with the bottom of the body. 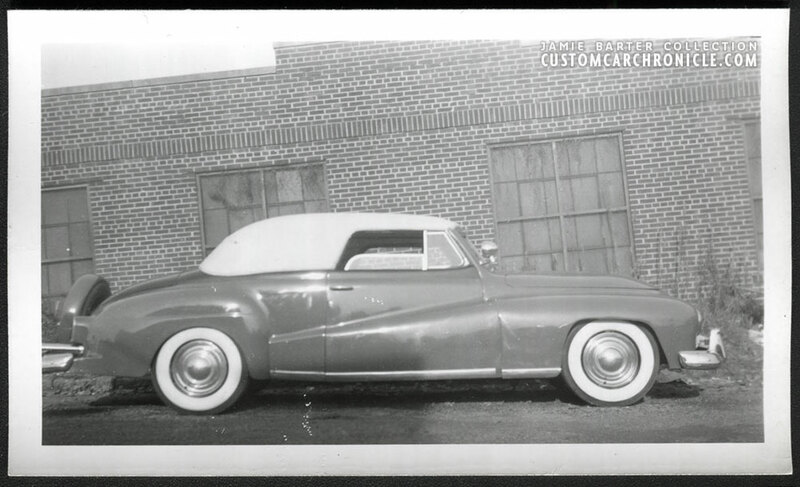 The running boards were removed, and all four fenders were molded to the body. 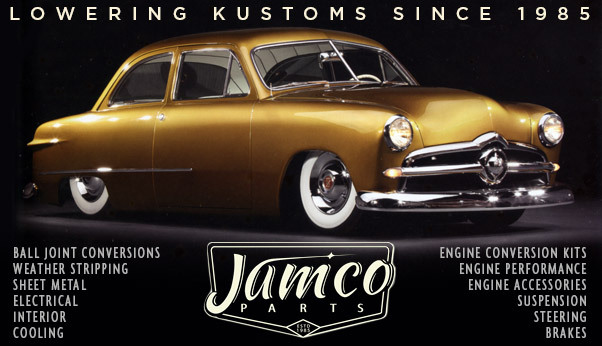 Possibly a different year and brand set of front fenders was used, or the ’41 Ford units were heavily modified. The front fenders were further modified into full fade away fenders. The hood was modified and a new much wider than stock front section was added, and a new hood line was cut along the belt line, and about a foot from the front of the hood. The front section of the nose was molded to the front fenders. The windshield was chopped a few inches, vent windows cut accordingly and for the first version the working soft top was modified to fit the chopped windshield and covered in dark material. 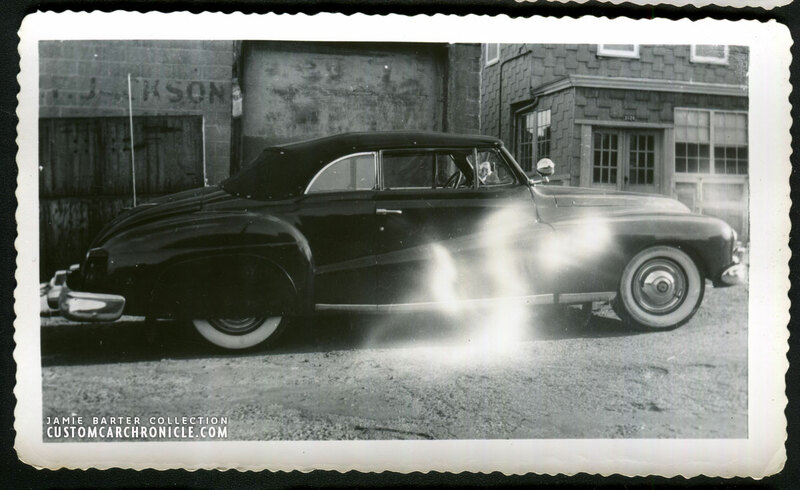 There is no photo showing the back of this version of the car, so we cannot see what kind of taillights were used, possibly 1948 Ford units turned 90’s degrees from original, possibly on custom made pods. It appears in the side view photo that the car already had exhaust tips in the rear portion of the rear fenders above the rear bumper. 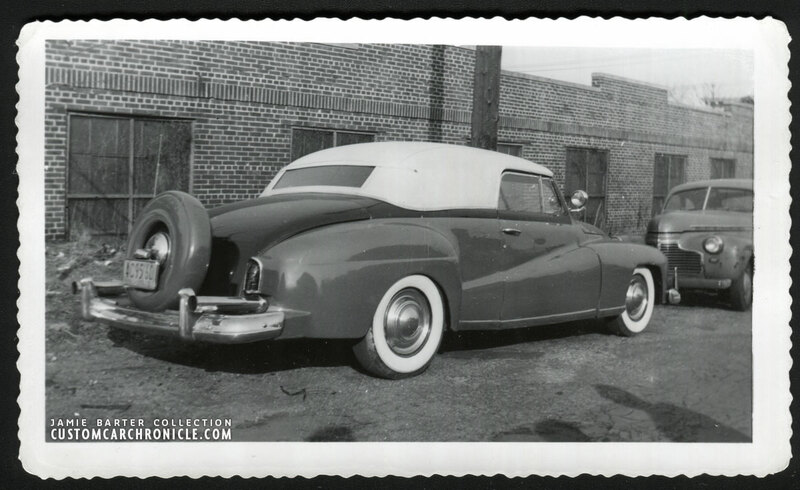 The first version of the car was painted dark and a set of fender skirts mounted on the rear fenders. 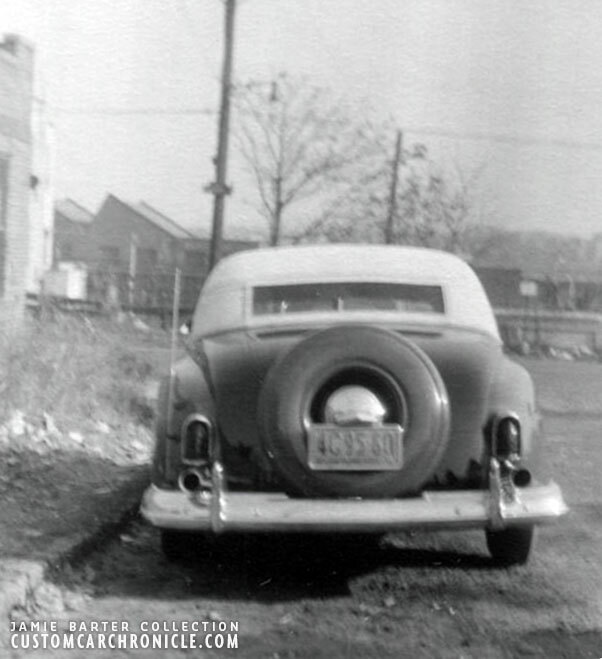 Side view shows the fender skirts, rounded front wheel openings, Lyons hubcaps on wide whites, and heavy stainless or chrome plated rocker trim, possibly created from 1947 Frazer rocker trim. 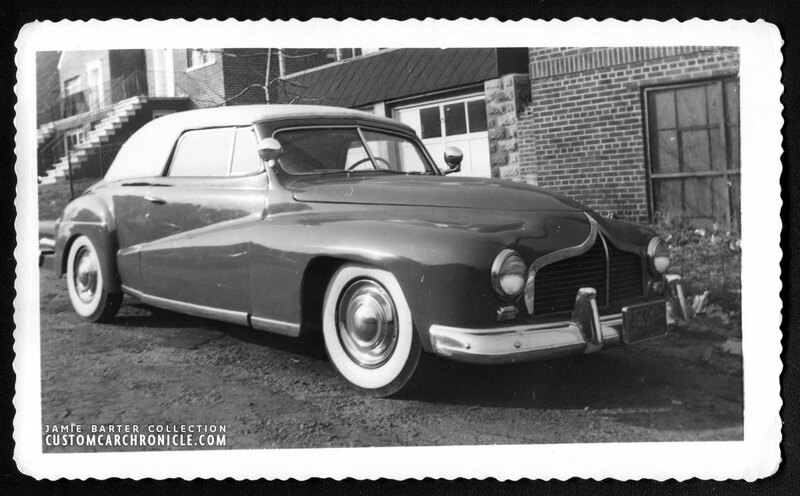 The grille on the car looks to be made from 1946 Studebaker components. The front bumper appears to come from an 1947 Dodge. Notice the wide front of the hood and one continues shape with no hood lines. This photo shows the round front wheel openings a bit better. The car is parked in front of the Raceway Garage shop building. The Raceway Garage sign can be seen on the left side of the building. 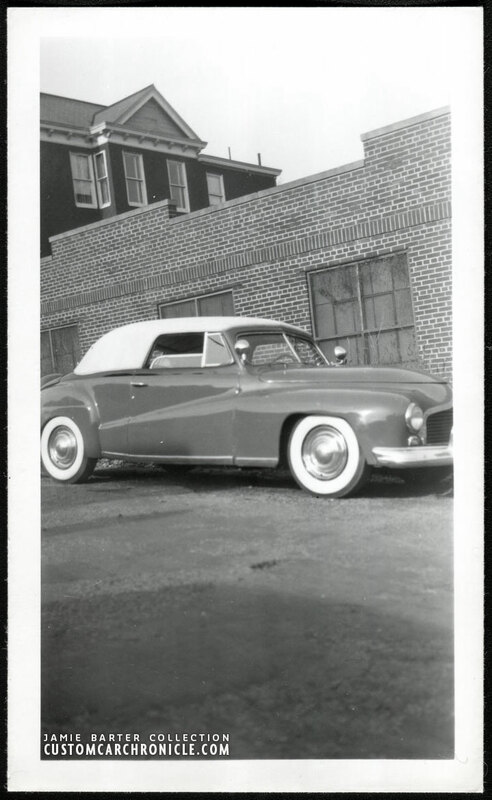 Some time later, most likely around 1950-51 the car was updated by Joe, we are not sure if this car was Joe’s personal car, or one of the many he created for his customers. The car was modernized with reshaped front wheel opening, a new all custom made grille very much inspired by some European Coachbuild cars. New taillights with what looks like 1951 Lincoln taillights lenses and surrounds on new larger molded in pods. A Continental kit and long molded in splash pan at the rear. The bumpers were replaced by 199-50 DeSoto units, hubcaps update with a more modern set of aftermarket units. 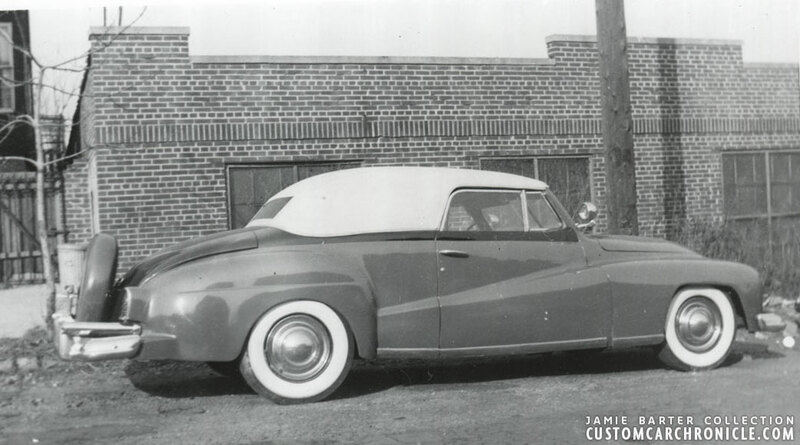 The folded top was replaced with a padded top covered in light colored canvas and now with the rear quarter windows filled in.The fender skirts were removed, and the car was painted a new, lighter two tone color. Personally I think the original version looked a lot better than the more Coachbuild inspired second version. 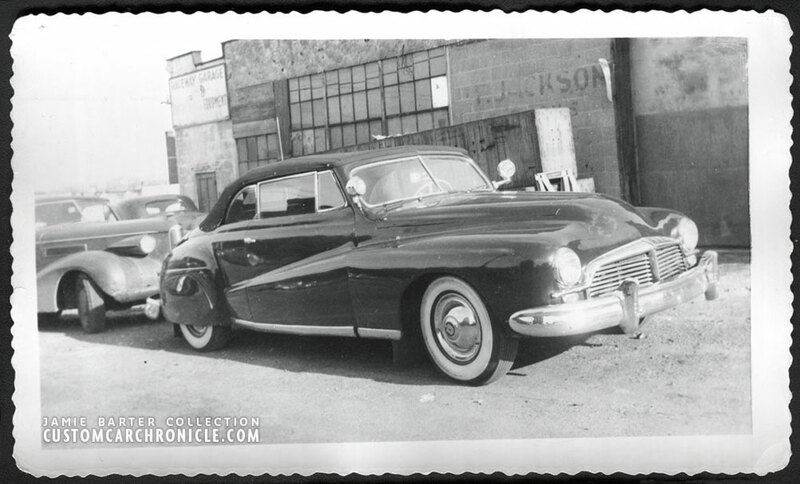 The new lighter color, the padded top, and the lack of fender skirts changed the looks of the car completely. It also appears that the front end was lowered a bit giving the car an kind of odd looking forward rake. One other modification done to the car was a new hood line cut into the front section following the belt line all the way to the front of the nose. The rear bumper most likely comes from a ’49-50 DeSoto woody with its distinctive cut out which was perfect for the added continental kit. Notice the rather large (for a padded top) rear window. Not sure if this is the owner of the car, or Joe Gertler Sr. posing with the car. 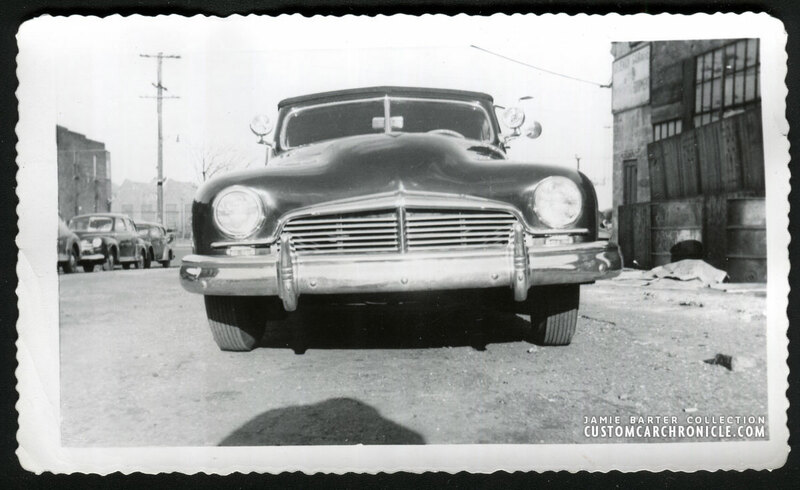 The new version of the car now has a set of 1949-50 DeSoto bumpers, and in this photo we can see the new hand made grille, and how the hood line was extended at the front so that the hood opens all the was to the front now. This a bit higher point of view shows the long exhaust tips mounted underneath the most likely ’51 Lincoln taillights on molded in pods, the long splash pan and continental kit. I have to say that the new version of the cars rear is not a improvement over the early version. Another odd thing from the updated version is the round rear wheel openings, while the fronts were squared off. Fender skirts might have looked better on this version as well. The car was painted in a new lighter color with the trunk and above the belt-line till the A-pillars in a darker color. This photo shows how the new taillights, long exhaust and spare tire are not really working to well. The original version of the car was much more in harmony. We came across a few photos of Joe and another guy working on new bodies Sports Car in the Raceway Garage Shop. Looks like there are plenty of project going on at the New York Bronx Raceway Garage Shop. Eagle eye, Rik! Yes, that grille, a 1946 Studebaker Champion. Very interesting car! I like the first version better, but the front end and top on the second version are fascinating too. The second grill looks very European. Looks like they did some amazing metalwork in that shop…definitely a different style on the east coast compared to what was going on out here in 1950. Those are ’51 Lincoln (Merc bodied Lido) tail lights- a rare find nowadays!